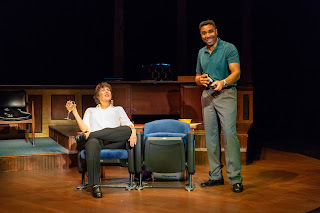 Delaware Arts Info: DTC Presents A Bruce Graham World Premiere in "Sanctions"
DTC Presents A Bruce Graham World Premiere in "Sanctions"
The Delaware Theatre Company (DTC) opens its 40th season with Sanctions, a World Premiere play by Bruce Graham. This timely piece touches upon controversial topics discussed daily in the news. Graham focuses on the darker side of college football — revealing the questionable business decisions that occur off the field and behind the scenes. It’s a gritty inside view of the challenging choices that some people make to ensure a successful team, regardless of the cost. Catharine K. Slusar and Edward O’Blenis in Sanctions. Graham has written a gripping play with four layered characters challenged by ethical and moral dilemmas about gender, race, and sexual assault. The superb cast features Catharine K. Slusar, in a terrific DTC debut, as the tenured English professor Claire Torrance, who is not only a great fan of the university’s football team, but is also the players’ educational supervisor. While Claire has recently lost her beloved father, with whom she attended football games throughout her life, and is grappling with a personal scandal in her marriage. Now, she faces a choice of what is more important — the love of the game, educating students or protecting the welfare of the student body. Slusar gives a textured performance. She’s able to bring a vulnerability to the strong role, delivering a completely formed character. The superb supporting cast includes Susanne Collins as the naïve freshman; Abby Barton, who works for Claire’ tutoring program, but also befriends Clair; Kimberly S. Fairbanks as the stern head of Claire’s department; Tonya Mann, who is not phased by Claire’s previous accomplishments, but is concerned about her current actions and comments; and Edward O’Blenis as the university’s go-getting recruiter, Ronald Hitchens, who works closely with Clair. O’Blenis is quite engaging as the ruthless Ronald, who will stop at almost nothing to form a winning team. He and Graham’s interactions intensify to a point that is easily palpable. The stirring cast is led by director (and DTC Producing Artistic Director) Bud Martin who has created a pace that never lulls but continues to reveal unexpected twists and turns. He’s able to do this with the help of the exquisite set by Dirk Durossette, which provides the scenes for Claire’s and Tonya’s offices; seats in the stands; and Claire’s living room, and the play moves seamlessly without having to move sets and reconfigure the stage. Graham has done a fine job of capturing the senstive issues and themes around the #metoo movement and university scandals that have recently and sadly continue to make headlines. Sanctions closes on September 30 2018. For tickets, visit delawaretheatre.org or 302.594.1100.